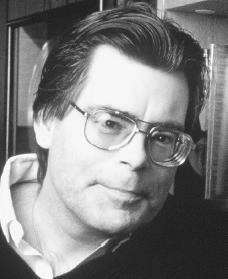 Stephen Edwin King was born on September 21, 1947, in Portland, Maine. When he was two years old, his father left the family, leaving his mother to care for Stephen and his older brother, David. She took a series of low-paying jobs to support her children, and as a result the boys saw little of their mother. As a boy King found a box of fantasyhorror fiction books and stories that had belonged to his father, and he read them all. By the time King was seven he had begun writing his own stories. He enjoyed watching science fiction and monster movies. "Writing has always been it for me," King indicated in a panel discussion at the 1984 World Fantasy Convention in Ottawa, Canada. Science fiction and adventure stories comprised his first literary efforts. King began submitting short fiction to magazines when he was twelve. He had no success at that time selling his stories, but he did win first prize in an essay competition sponsored by a scholastic magazine. In high school King authored a small, satiric (poking fun at human weakness) newspaper entitled The Village Vomit. He published his first story at eighteen in a magazine called Comics Review. King graduated from high school in 1966. He received a Bachelor of Arts degree in English from the University of Maine in 1970. He married Tabitha Spruce, also a writer, the following year. They have three children. After graduating from college, King taught English at a high school in Maine and added to his income by holding a number of part-time jobs and by writing short stories for several popular magazines. He did not receive much money from the sale of his stories. Sometimes he was not paid at all but was given extra copies of the magazine to show or sell to other people. King's first novel was Carrie, published in 1974. It was a huge success, which allowed King to quit his other jobs and write full-time. With this book, King became one of the top writers of horror stories. King's fiction features everyday language, attention to the details of the story's surroundings, the emotional feelings of his characters, realistic settings, and an emphasis on modern problems. King's popularity comes from his ability to create stories in which evil occurs in ordinary situations. Many of King's stories are semiautobiographical, meaning that they are taken in part from some of his own experiences. Many of the locations he writes about are based on the places he grew up in when he lived in Maine and other locations. Many of his stories deal with ordinary people who are faced with frightening events they have to try to understand and overcome. A publishing marvel, King has nearly one hundred million copies of his works in print worldwide. He is the first writer to have had three, four, and finally five titles appear simultaneously (at the same time) on the New York Times bestseller list. and large in scope) The Stand is close in structure to J. R. R. Tolkien's (1892–1973) Lord of The Rings. It tells of a battle between the forces of good and evil. King used to write every day except for Christmas day, the Fourth of July, and his own birthday. Very often he would work on two or three stories at a time, switching from one to another as ideas came to him. King has also admitted that during the period between 1977 and 1984 he wrote five novels under the pseudonym (a false name used to hide the identity of the writer) Richard Bachman. He did this to disguise the true extent of his prolific (abundant, in great quantity) work. Also, his publisher believed that he had already saturated (filled to capacity) the market. In his stories King also likes to write about how people relate to one another in scary situations. His characters are taken from both young and older people who come from many different backgrounds. King has said that he just wants to scare people. He likes to frighten his readers after he has made them love his characters. While stressing the importance of characterization (describing the qualities of characters), he regards the story itself as the most essential part of crafting fiction. Even though he is very successful, King is modest. In an interview with Yankee magazine he said, "I'm leery [cautious] of thinking I'm somebody. Because nobody really is. Everybody is able to do something well, but in this country there's a premium [special value] put on stardom." He also said there is an "occupational hazard" (a danger based on a job) in being a successful writer, because of all the attention a writer can receive. King had his own personal experience with horror on the afternoon of June 19, 1999. As he was walking near his summer home in Bangor, Maine, he was struck by a van. King had many operations to repair a collapsed lung and multiple fractures (small breaks) to his leg and hip. He then spent many months recovering in the hospital. King did get well but did not regain the same state of health he had before the accident. The driver who hit King claimed the dog in his van distracted him. It was found he had several driving violations (acts of breaking the law). He was fined, but he did not go to jail, nor was his driver's license taken away. Many of Stephen King's books and stories have been made into movies for both Hollywood and for television. These include Carrie, Salem's Lot, The Shining, Christine, The Shawshank Redemption, and The Green Mile. In 2000 King's publisher, Simon & Schuster, published his novella (short novel) Riding the Bullet in electronic form. After that King became the first well-known author to self-publish on the Internet when he published several segments of a new book, The Plant, on the Web. In 2000 he also wrote On Writing: A Memoir of the Craft. In this book he tried to give advice to people who want to become writers based on his own experiences. In early 2002 King announced his retirement from writing, saying that he has said everything that he set out to say. Stephen King is regarded as a master of the horror story, developing this type of tale to a new level. The ideal format for horror tales used to be the short story, but King is one of the first to challenge that idea. He has written not just successful horror novels, but successful, long horror novels. His fans may take comfort in the fact that retirement is not always permanent. Beahm, George W. Stephen King: America's Best-Loved Boogeyman. Kansas City, MO: Andrews McMeel, 1998. Collings, Michael R. The Many Facets of Stephen King. Mercer Island, WA: Starmont House, 1985. Keyishian, Amy, and Marjorie Keyishian. Stephen King. New York: Chelsea House, 1996. Wilson, Suzan. Stephen King: King of Thrillers and Horror. Berkeley Heights, NJ: Enslow, 2000.